What is the Best Work From Home Headset You Can Buy? Published October 20, 2014 By Leisa Good This post may contain affiliate links. Regardless, I only recommend sites I've researched and/or used and trust. Congratulations, you just landed your first work at home phone job! While you excitedly get your home office arranged and decorated to your liking to begin this new adventure, you’re also a little nervous. Why? Because one of the requirements is you must have a headset. That means you’ll have to buy one. And with so many choices, prices, and brands to choose from—where do you even begin to look? This article will show you just where to begin and how to end with the headset of your dreams. Well, maybe not your dreams — but a headset that works best for your needs, feels comfortable to you, and is well within your budget. 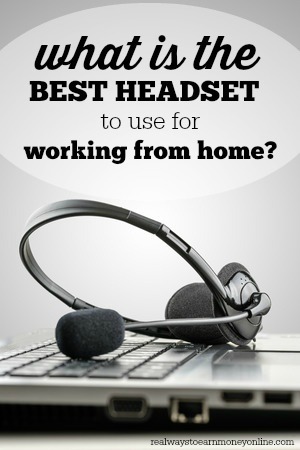 What Are the Five Main Points to Remember When Selecting a Work From Home Headset? What will you be using the headset for? Does the headset need to be noise-canceling? Does the headset need a microphone attached? Will the headset need to be wireless or corded? How much headset can you afford? Above, when asked the question, “What will you be using the headset for” — obviously for work — but will you be attaching it to your landline phone or your laptop or PC? The headsets for the laptop or PC are going to have a USB port plug, whereas the headsets for the landline phone are going to have a phone port plug. The two cannot be interchanged. Most work at home jobs that require a headset will spell out exactly what you need or even give you a list of what they consider the best headsets. Even if your new call center doesn’t tell you exactly what to buy, you probably have been given a list of required features for your headset. Some call centers will also require that you get both a headset to use for your hardwired landline phone and your laptop or PC to use for Skype meetings. What Are Other Features to Consider When Selecting a Headset? Price is certainly something to consider, although most headsets are not that expensive unless you really want a lot of “bells and whistles” to go with it. There are headsets which can go up to almost $250. What about comfort? How comfortable do you want to be? While the headset may be a great headset, it can also be very heavy, making your head and neck tired. If you are going to be working long days that is something to consider. Also, how do you want to wear the headset? Do you want to wear the headband of the headset over the top or your head or the back of your head? I once had a headset (wearing it over top of the head) that was wonderful as far as features, but it was so heavy that it made me look like a pilot. I kept wanting to tell my call center customers “over, roger” instead of “thank you and good bye”. So, What Really is the Best Headset to Use to Work From Home? One call center that I know of recommended the Plantronics so highly that they even offered $50 towards a purchase of one. Most call center agents that I have spoken with also agree that Plantronics is probably one of the best to use. Other good brands are Panasonic with the Panasonic KX-TCA 430 being a very good, noise-canceling headset for the phone as well as the Sennheiser CC520 Binaural. Both are available on Amazon.com. Amazon isn’t the only game in town as far as headsets go. HelloDirect has a wide selection of headsets and phone systems to order—all with competitive prices and live chat support. This list is not in any particular order. It is just a list several call center agents and I compiled based on their call center and experience. If noise-canceling is not an issue, then both Walmart and RadioShack carry a variety of GE (General Electric) and Gigaware for phone, laptop/PC, and mobile devices for listening to music. Prices will vary on all of these, but the average cost of a good, noise-cancelling headset for either a landline phone or laptop/PC is approximately $35. While every call center agent you talk to will have a preference, most agents do like the Plantronics headsets. Another excellent option is Home Agent Headsets. This is a small business that specializes in providing home call center agents with the exact equipment needed to work for many well-known online call centers. You can find the equipment you need for Arise, Convergys, Sykes, Language Line, Blooms Today, TeleTech, Live Ops, West at Home, Working Solutions, and several other companies. Home Agent Headsets is a great option because you'll know you're buying the correct equipment for the company you plan to work for without any guesswork, plus the prices are reasonable. So, there you have it. These are the best headsets to buy with your needs, comfort, and budget! Now get shopping, so you can get working! I have been looking for a home use phone and headset solution that works with land line, pc and smartphone, binaural headset with noise canceling mic, dialpad with recording option and that allow me to move freely. Any recomendations? Any headsets specifically good at cancelling out kids in the background? I live on a busy street, and even with the window shut, I can still hear some noisy cars outside, and definitely a passing EMS vehicle now & then, over my USB headset. Is there any noise reduction software for windows 7 (64 bit) that can improve the noise cancellation? @Etamni – Awesome comment. Out of my five headsets, my Plantronics is my favorite. I’ll second the opinion regarding Plantronics headsets. I work in a call center and was issued a Plantronics headset during training. Now, more than three years later, I’m still using that headset without any problems. Replacement cost is reported to be just over $100.00. I don’t know the model number, and in any case, this particular model has a specialized connector and would not connect directly to a land line phone or a PC without an adapter, but I’m sold on the brand. Any experience or information will be truly appreciated. For got to say is for a computer so it has to be USB thank you. Remember, Headsets & LandLine Telephones wear out. When you are satisfied with the Headset & Telephone you’re using, then it’s wise to buy a backup unit for each device. As a 30year Bell System Technician, I know ALL phones and headsets wear out.